When getting any product, it's very important to learn about the product first. Three key elements are the looks of the product, the quality, and last is customer service. I'll start with the looks. Umnitza angel eyes look amazing on my car, Infiniti i35. They are extremely bright and crisp. I was surprised to see how the little LED ring can have such a great output. I got compliments from new BMW X5 drivers to 80 year old grandmas, honestly. The kit comes with two trigger wires, so I hooked one trigger wire so that lights are up whenever I start my car and another trigger wire I hooked up to my interior lights so whenever my doors are open or I unlock my car, the lights go on. The angel eyes I got cost about $200 and they come with 1 year warranty. Now let's talk about quality. The looks of these lights were best part from three elements of the lights. Unfortunately it's getting worse now. For 5 months I had no problems with the lights at all. One night I noticed that half of one of the rings did not work. When I got home and looked at the headlights, all rings worked again. I thought that I was just looking from a bad angle and in reality all lights work fine, I was wrong. 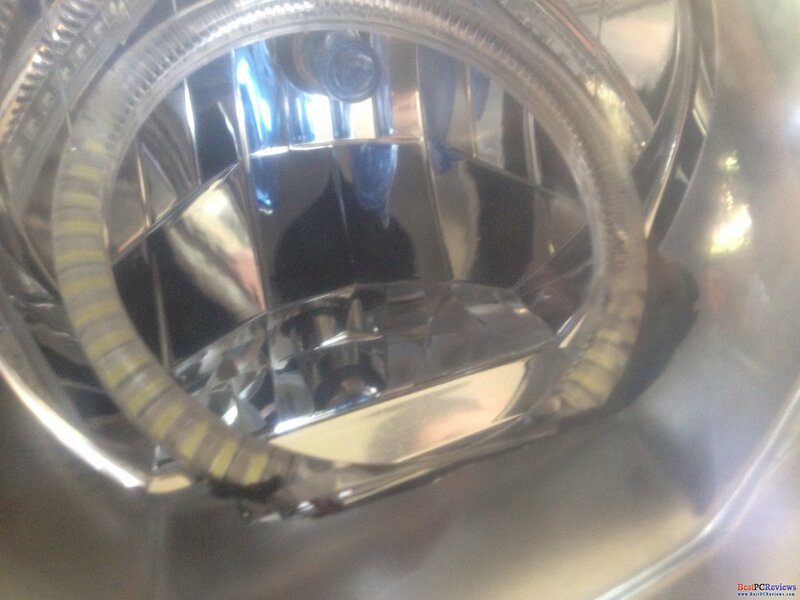 After couple weeks, I noticed the same problem on another headlight. I got in touch with umnitza owner and he said that the rings will have to be resoldered, so I need to send the rings back to him. I did some research on internet and found out that I was not the only one with the same problem. It should be noted that the problem was only on 6cm rings. Now its time to talk about the customer service. It might take some time as this is the worst part of Umnitza and actually the worst customer service I ever dealt with. Let's start from beginning. 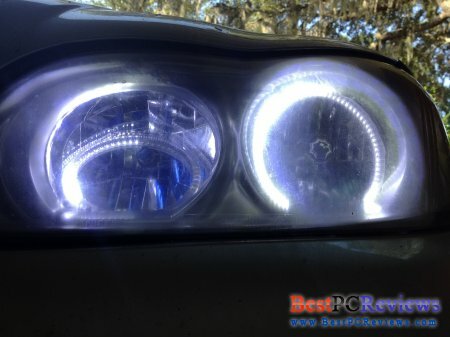 I placed custom order for the angel eyes, specifically for my car. Order went through fast and I got the set within 2-3 days. The problem was that the size of the rings was twice smaller than I needed. I got in touch with support, telling them that I will return this set and ask for new set with exact measurements. About a week later, after returning that set, I contacted Umnitza and told them what size I needed and they told me they will send it right away. 4 days later I called again and it turned out they didn't send it yet. Called couple days later and they recommended me to send them the headlights and they will do the installation since they have all the rings and they'll be able to find exact rings I needed. They said installation cost is $150. So I send to them my headlights with shipping price of $52. It took Umnitza about 2 weeks and about 8 calls to the customer service. They even lied to me saying the item was shipped and then day later telling me it wasn't shipped yet. I was not able to drive my car for about 4 weeks. Well, later on I received the headlights. It was nice to finally put the headlights back, Umnitza messed up again though. They forgot to include a wiring kit with the package, but at least I was able to drive now. I called the customer service, telling them that they forgot to send me wiring kit. They said they will send me one immediately next day. Since I didn't get the confirmation on email, I decided to give them a call couple days later. It turned out they didn't send me the wiring kit. This time they send it and included tracking number in the email and I got the kit in couple days. Well, after putting it all together, headlights looked awesome. Lights are bright and looks are perfect. Six months later, some of the rings started to flicker and sometimes not work (half of rings). After some emails with Umnitza owner, we came to conclusion that the rings are defective and I need to return my headlights so that Umnitza will fix them up. Since I wanted to be able to drive my car as soon as possible, I sent the package via 2-3 delivery USPS. I sent the package on Monday and they got it on Wednesday. I emailed Umnitza and was told that they will start on it on Monday. I called customer service Monday evening to see how it's all going. I was told that it's really busy there and most likely they'll be able to fix it on Tuesday. On Tuesday I emailed Umnitza and was told that the lights will be done by Friday. Called on Friday and spoke with Umnitza owner, who informed me that they lost one of the best workers and that's why the lights will be done the following Tuesday. He apologized for the delay and said my lights are 3rd or 4th in line. Called customer service on Tuesday afternoon and was told that they lights are done and that they are testing them right now. Asked if they will be shipped out today and was told that they want to leave them on overnight to see if it will fail. They told me it should be shipped tomorrow. I said I will call again tomorrow. Called next day, (umnitza had my lights for two weeks now) and was told that everyone is at lunch and they will call me back in one hour. Left my name and phone number. Never received a call so I called two hours later. They told me lights are done and they will be shipped today. I asked if I will get confirmation email with tracking number today and was told I will. I did not receive an email. Called next day. Actually tried to make a call. First time I called from my phone 5 times after couple rings it went to voicemail. After one hour later, I called and after couple rings it went to voicemail. Called again and was immediately put on hold for over 6 minutes so I hung up. Then I asked my brother for his phone, called and someone on the other line told me the lights are in the truck now and I will get confirmation email with tracking number later this day. I did not receive it. Called next day to see if the lights are done and was told that they were shipped yesterday. The person I spoke with told me he himself packaged the lights. I asked him about tracking number and email confirmation. He said he would have to ask someone and someone will call me back. Left my name and number, but nobody called me back and did not send me email with tracking number. Later that day, Friday, I received email from Umnitza saying lights are done and I need to pay $40 for shipping. At this time, after waiting over 2 weeks I didn't care about paying shipping, even though usually manufacturer pays for shipping item back. I paid the money via paypal and asked on email whether my lights were shipped yesterday, Umnitza owner said they were not and that they will be shipped on next day, Saturday. Just to confirm, I emailed Umniza on Sunday and was told that lights were shipped yesterday. I went on my email and did find the tracking number. Week later, I got the headlights. I was excited to finally install them since I didn't drive my car for over a month. When I put the lights back in, I saw that I had exactly the same problems as I had before and on top of it, one angel eye was not attached correctly. Seems like it was damaged when they were trying to fix it. I emailed umnitza regarding the issue and asked what options he could offer since I didn't want to wait another month. Couple hours later I got response from umnitza saying that they resoldered the rings, spent 4 hours fixing it, and left them on for 2 days. He said that the ring came off because of shipping. What surprised me most is that umnitza said that for them to try to fix it again, I will need to pay for labor. Keep in mind that parts and labor have one year warranty and I've been using them only 6 month. Well, thats end of the story. 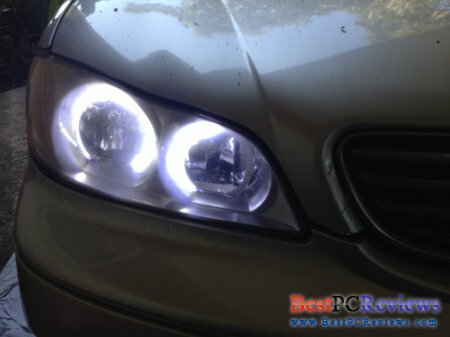 After getting that response, I am planning to buy used pair of headlights and forget about angel eyes. You are welcome to post this review anywhere with original source. I hope umnitza will improve their service, but its a LONG way to go. Since Umnitza told me earlier that I could buy new pair of rings and when I ship him old ones, he will refund the money, I sent him message asking about the deal. He said that currently the rings are out of stock. I asked him when they will be in stock. Their response shocked me. They said it depends. They said they saw my review (on maxima forums) and that if I will remove the post, they will ask their manufacturers to hurry up with the rings. Now, I am 99.99% sure that its all BS. 6” rings are pretty common product as (I believe) Maxima uses them, BMWs, and other cars. Later, Umnitza said that they want me to erase all negative and positive aspects of the review and put sentence that we are working on fixing the issue. I told them that all I can do is add sentence at the bottom of the review that we are working on fixing the issue. I also told Umnitza that if everything works out successfully, I will update my review. They did not like my idea, only way they wanted for this work is to delete all negative and positive aspects, which will delete a good 95% of the review. I told them I will just wait on when it will be in stock. They said it should be 2-3 months. Now I believe that even if they were out of stock, it would be for about a week as there are good numbers of cars that use angel eyes that size. Well, I gave up on them once and for all. 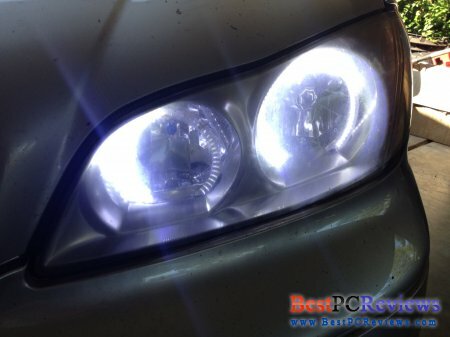 I ordered myself another pair of headlights as the ones I had looked pretty bad after couple installations Umnitza conducted. When I was removing parts from old headlights, I saw that Umnitza done some extensive damages to my headlights including broken plastic at the bottom of one of the headlights and some scratches around edges of the headlights.